It’s easy to capture digital memories, but managing all those photos and videos is a galactic drag (after all, there’s no fun in workflow). Unless you’re a pro photographer, it’s hard to force yourself into good habits around renaming, keywording, organizational, and most importantly backup. If you don’t, you can lose a lifetime of memories, plus it’s impossible to find specific photos because they’re stored across various computers, iOS devices, external hard drives, bras (kidding! ), and social media sites. Heck, you’ve taken a slew of photos you’ve not yet seen. Enter Mylio, a database-driven, nondestructive editing and syncing app launched in October 2014. It’s designed for anyone who takes pictures (hobbyists and pros), managing all your photos—iPhone, Facebook, point-and-shoot, DSLR, whatever—in one place, side by side. Mylio also syncs your photos among the desktop, iOS, removable, and remote devices you tell it about, so your entire collection is always backed up and accessible in multiple places. You can edit, share, and export photos using Mylio, too. Sound too good to be true? Let’s find out! 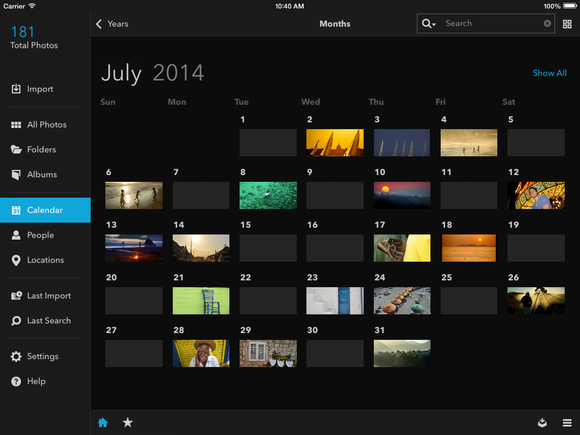 Mylio's iPad app lets you control exactly what gets synced to your tablet, and the calendar view is a great way to find photos in your collection. Once Mylio is installed on your Mac, you can import photos from your hard drives, CDs or DVDs, iOS devices, Adobe Photoshop Lightroom, Facebook (including photos taken by others that you’re tagged in), your Instagram album on Facebook, Flickr, and iPhoto (full Instagram support is forthcoming). Importing photos from folders on your hard drive is fast and you can choose to add, copy, or move them; adding photos doesn’t duplicate them and keeps your existing hierarchical structure intact (choosing copy or move places them in Mylio’s own directory). In my testing, importing from iPhoto takes longer. It took a couple of hours to copy 26,000-plus photos, and my Mac crashed due to memory depletion, though after restarting and launching Mylio, the import picked back up and finished without a hitch. Importing from Lightroom takes a little forethought. If your Lightroom catalog lives in a parent folder containing subfolders of photos, it’s best to use the “Add folder” function instead of “Import from Lightroom.” That way, Mylio references the same location that Lightroom uses, enabling you to pass images to and fro. Once you use the “Add folder” function, or import from an iOS device’s Camera Roll, that folder becomes a “watch” folder; add more photos to the folder and they’re automatically imported into Mylio, which is huge for both pros and hobbyists (imagine having an export preset in Lightroom that sends processed images to a watch folder, or dragging email attachments into a watch folder on your desktop). As you can see, you can import photos into Mylio from many locations. Syncing photos to other devices, local or remote, is fairly easy, too, though a fast wireless network is best. If it’s an iOS device, download the app and sign into your Mylio account, then sync your Camera Roll and the watch the photos you imported into Mylio on your Mac immediately begin to appear on the device (slick!). You can also sync to local or remote computers and external drives. 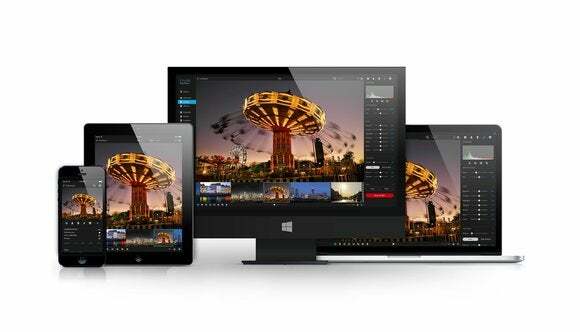 Mylio gives you total control over what photos—in what sizes—sync to which devices. 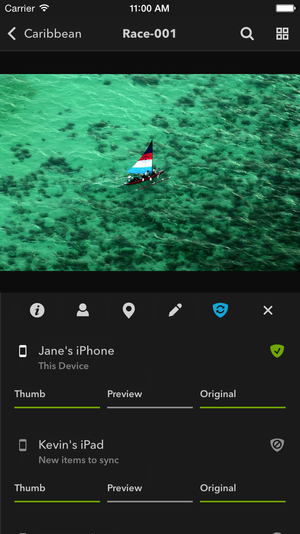 Happily, you pick exactly what is synced on each device—thumbnails, previews, or the originals. For example, you may sync thumbnails or previews to iOS devices and originals to computers and external hard drives (if you shoot in raw format and choose to sync originals to an iOS device, a lower resolution raw file is sent by default though you can change that). You can also limit syncing to a subset of photos, say, only those that are 5-star rated, color-coded or that have certain keywords. Three shields at upper right of the interface show protection status: the first shield indicates that you have the originals on the device you’re currently using. The second shield indicates that you have the originals on another local copy, and the third shield indicates that you have the originals on a remote device at an offsite location of your designation (perhaps an external drive kept elsewhere that you periodically plug in). While Mylio includes cloud storage, it’s only used for remote syncing (think “transfer highway”), which is incredibly handy when traveling or shooting on location (imagine syncing a subset of photos onto an assistant’s remote device!). You manage syncing on each device independently (top). These three shields (bottom) start at clear, go to yellow, and finally green as your library is fully synced across local and remote devices. Mylio lets you arrange photos into albums, lightboxes, tag them with people and location info (think facial recognition and geotagging), apply a flag, 5-star rating system, and color-coded labels—all of which you can use to find photos later on. A handy Auto-Advance switch lets you move to the next photo once you tag or rate the current one. Built atop a gaming GPU, browsing thousands of photos in Mylio is smoking fast. You can view photos by their import folders, albums you’ve made, by date visually on a calendar (nice! ), by people or location tags, your last import or search. The search bar lets you find photos using keywords, flags, or ratings, though you can also view them in a slick calendar view. Editing in Mylio on your Mac or iOS device is easy and nondestructive (you can’t edit image thumbnails on iOS devices, but you can edit previews and originals). You’ll find a histogram, as well as auto-enhance, crop, and red-eye tools, a before/after comparison button (nice! ), temperature and tint sliders for adjusting white balance along with sliders for exposure, contrast, highlights, shadows, whites, blacks, clarity, sharpen, vibrance, and saturation. You can convert photos from color to black-and-white, copy edits from one photo to others, change date/time, edit metadata, and revert to your original. When you import photos from Lightroom, the edits that Mylio supports can travel back and forth. 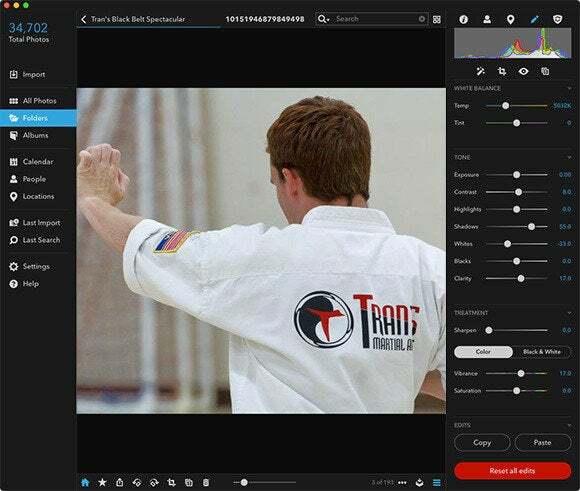 Mylio’s editing features are similar to those found in the Basic panel of Adobe Camera Raw, Lightroom, and Apple’s Aperture. Unfortunately, as of this writing, there’s no way to adjust parts of a photo (say, to darken just the sky or remove an object) or create projects such as photo books, print templates or web galleries. That said, you can send photos from Mylio to Lightroom and the company states aggressive plans for future versions. Incredibly, anything you do in Mylio is instantly synced, and thus reflected, on all devices. You can also share photos via email, Facebook, Flickr, export them (say, to create projects with in other apps) and print straight from Mylio (expect Twitter support soon). The reality is that you won’t have fewer photos in five years, you’ll only have more. If you’ve ever longed to enjoy managing all your photos and videos in one program, easily accessible on all your devices and continually backed up (whew! 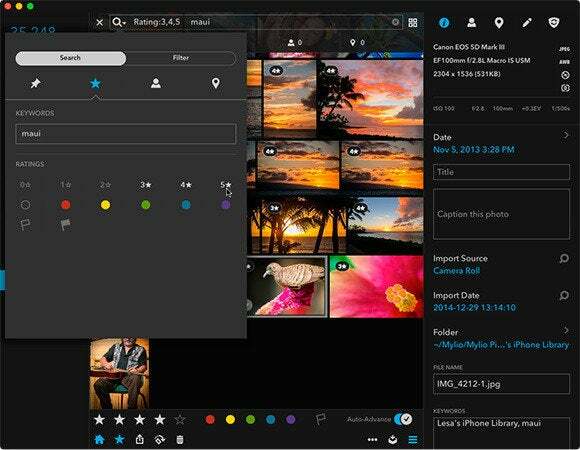 ), then Mylio could be the photo management app for you. Even though you can’t create the kind of print or web projects like you can in iPhoto, Aperture, and Lightroom, automatic backup peace of mind may be worth the tradeoff. But price may be a tradeoff too: Mylio's Advanced subscription costs $250 per year for raw editing, 12 devices, 500,000 photos, Lightroom integration, Shuttle, 25GB of cloud storage. A standard subscription is $100 per year for raw editing, 5 devices, 100,000 photos, Lightroom integration, and 10GB of cloud storage. The new Basic plan offers support for up to 50,000 images in JPG format only plus basic editing, on 3 devices, for $50/year. But you can kick the tires indefinitely with a trial subscription, covering 3 devices and 1000 photos. 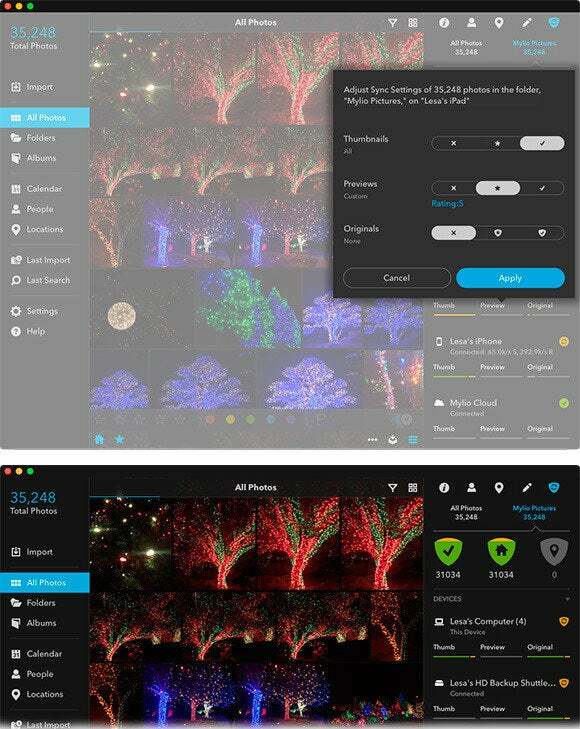 For now, pros who use Lightroom and Lightroom Mobile benefit from Lightroom’s superior feature set, but miss Mylio’s unique ability to corral all their photos and videos into one program that’s accessible (and backed up) on multiple devices. With an app this exciting at version one, it could be a killer app at version two. Update January 1, 2015: A previous version of this review omitted the Basic plan, which was announced after this review was written but before it was published. If you’ve ever longed to enjoy managing all your photos and videos in one program, easily accessible on all your devices and continually backed up (whew! 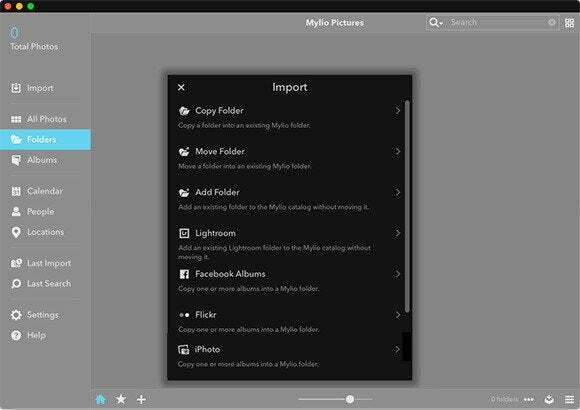 ), then Mylio could be the photo management app for you.